My mother and father lived as a team. They worked together, played together, and raised children together. When my mother developed Alzheimer's disease, my father stayed by her side, day and night, helping her through it every single step of the way. Even when my father died at the age of 93, my mother remained peaceful and content. I knew she could still feel him next to her, always by her side...and with her, all the way. My parents story, like so many others, goes back 61 years and through many challenges. They met during WWII and my father had to travel 5,000 miles to meet, and court her. Five children later, a house that burned to the ground around them, and the near death of three of their five children, they simply persevered through it all. When my mother was diagnosed with advanced (stage 3b out of 4) inflammatory breast cancer, my dad brought my mother south from Alaska to Oregon...to live with me and have the three of us help her go through 3 months of the strongest chemotherapy our Salem Cancer Center had ever used, a 3 month period for a mastectomy, and three months of intense radiation. With almost no chance of surviving because of her age, other illnesses, and its late stage, she did anyway. But tragedy struck again. She survived an impossible cancer only to face the ravages of Alzheimer's Disease. As devastating as this was for my father, he never left her side, performing all household tasks like cooking, cleaning and laundry, and all personal care for my mother... until his death. He helped her every day of his life, even while he was,himself recuperating from two heart attacks, and congestive heart failure. He could barely walk to the kitchen, but when he did, he was carrying two cups of coffee.....one for her, and one for himself. And with what little energy he had left, he sought to engage her in conversation and to bring her out of the deep lost place she had retreated to. When he died, I lay by her side, for three days and three nights, always holding her hand and talking to her in his place. When she finally realized it was me, and not him, on the fourth day and asked me if he had died and I very gently explained how he got very old, and very tired, and very sick..she told me 'It's ok, then, Michele. That is what he wanted and needed to do. I'll be ok." And she was. I told others she could still feel him all around her...in the house he built with his own hands for her and in the every thing that we did for her in his place. Always, together...even past death...they are together, all the way. As I looked at all of the 25 or 30 quilts that I've made and given away this year, it was this little tiny one that I knew I had to feature for Amy's Fall Quilt Festival. It symbolizes why I quilt..to give my life purpose and meaning and not just as a hobby that I love. And yes, my stories are very, very personal. They have to be. 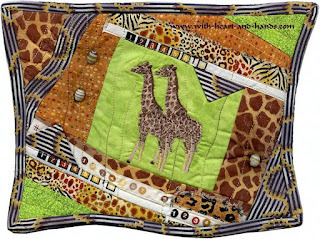 Like the little giraffes on this art quilt...we are all sticking our necks out to bare our stories, our pain, our loss, and our souls to work together for a cause. And A.D. creates a jungle...figuratively and literally in the brain with its plaques and tangles....so, giraffes and jungle fabrics! As a family who completely cares for our mother in her home, with no outside help, on an island in Alaska...we often refer to zoo and jungle as our lives now with this horrible disease. But many more are available on the AAQI website including our fabulous November 1-10 auction AAQI Stanley Cup Quilt Off featuring some very famous quilters and some super amazing quilts! Materials/Techniques: Machine embroidery, free pieced cottons, selvage strips, prairie points, and ceramic beads. 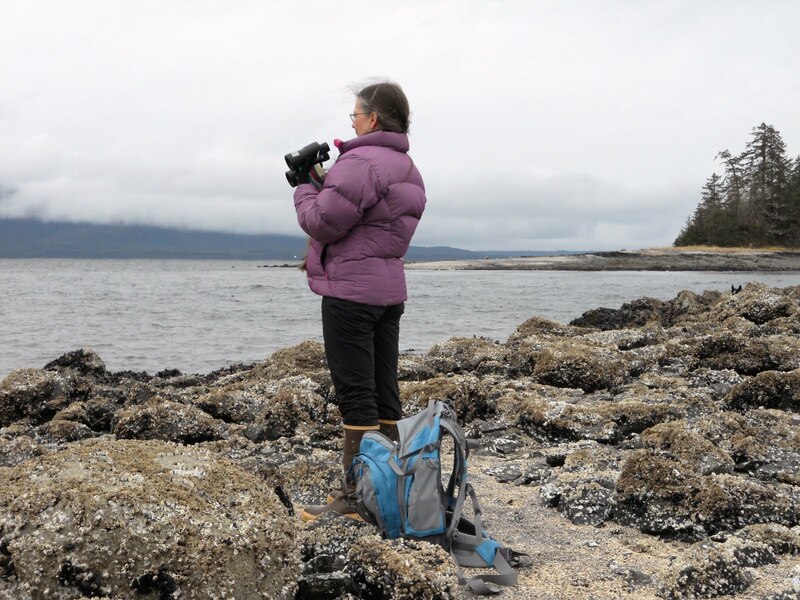 Artist Statement: My mother and father lived as a team. They worked together, played together and raised children together. When my mother developed Alzheimer's disease, my father stayed by her side, day and night, helping her through it every single step of the way. Even when my father died, my mother remained peaceful and content. I knew she could still feel him next to her, always by her side and with her all the way. Dedication: Dedicated to all who remain steadfast and true to those they love, trying their best, no matter what that might be, to stay with them and help them through all of the challenges of life. Such a perfect little quilt to show the world the love between your parents. How great the bond! What a powerful story of love and devotion. 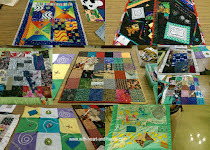 A beautiful tribute to your parents, Michelle, and a lovely quilt to honor them and support AAQI. Your story certainly brought me to tears! How loving and endearing are the words for your parents. Your quilt is a really lovely, sweet impression of that story. Wonderfully done! Thank you for sharing it with us. Thank you for sharing your beautiful story and your lovely quilt. Precious, almost beyond bearing...if only we could all be as 'fortunate' as your beloved parents. The little quilt is a perfect interpretation. As usual, your quilts are full of meaning, Michele. The personal touch makes each of your little quilts reach out to people. 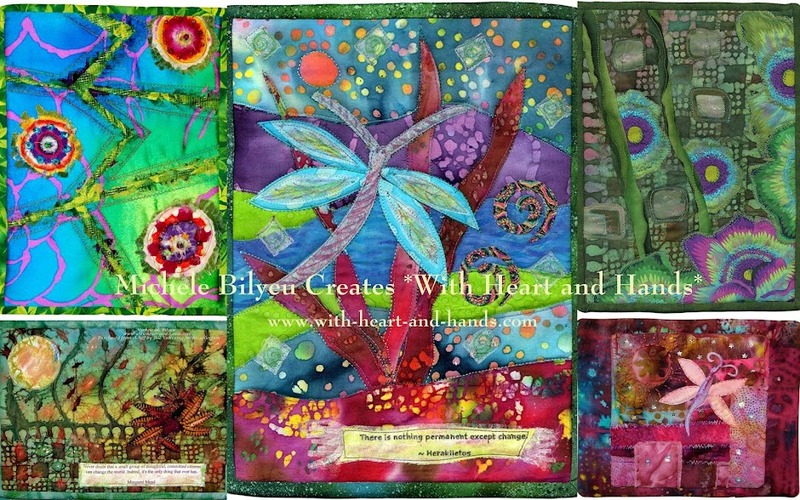 What a beautiful story and beautiful quilt to commemorate their life and love. You made me cry, but those tears are for you and the wonderful daughter that you are. Michele, your story touched me deeply. You are in my thoughts and prayers. Lovely story Michelle, good luck and take care. What a beautiful love story. That kind of devotion is rarely found in this world today. You are so lucky to have found a cause and a hobby that feed your soul. It's a beautiful quilt with a very personal story. Thank you for sharing about it. What a lovely story, Michele. Thank you for taking us all on that journey of remembrance with you. May all our quilts for sale in Houston bring in the resourced needed to find a cure for this horrible disease! What a wonderful story, and a wonderful little quilt. I work in a "Memory Clinic" aimed at early diagnosis and management of dementia so have seen so many families affected by this disease. a true love story - thank you soooo much for sharing it. Alzheimer is a dreadful disease ... and so many families are affected by it. Thank you for sharing your parents' touching story - and your beautiful quilt. What a beautiful story of your mother and fathers and their commitment and love for each other and their children. Prayers for your mother's peace. Your quilt is gorgeous and your story is beautiful. That is a beautiful love story and a beautiful quilt. thank you for sharing. What a wonderful story and a wonderful quilt. What your parents had was amazing and something for us all to aspire to. Thank you for sharing both their story and your quilt. This is the kind of story we need to hear from time to time. Thanks for shering. A sweet share and an adorable quilt. Thank you. Thank you for sharing your story of this beautiful quilt. It touched my heart in more ways than I'm sure you will know. Your quilts and your stories just plain get to me. I can't believe how talented you are with words. 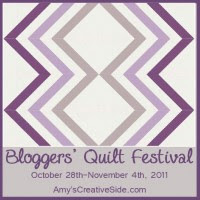 I love this little quilt and it just stood out for me among all of Amy's quilt festival quilts..I knew it was going to be yours right off. Just beautiful. You have a real gift for touching us with your work. Really cute quilt. You made me cry. Good cry. You know the kind that reminds you of things you lost or wish you had. Thank you for this. Your post today brought tears to my eyes. The quilt is as beautiful as the story of your parents' love! Thanks for sharing them both! 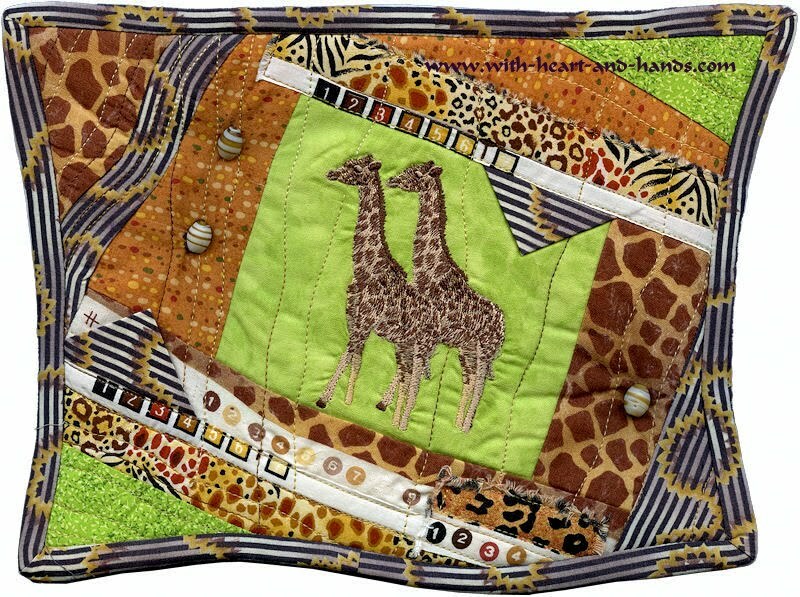 Such a beautiful story for a beautiful quilt. I can only imagine the beautiful spirit within you! I wish was was in Houston to purchase this lovely project! Someone will own a new treasure! Your quilt is wonderful and your story very poignant. Thank you for sharing your story with us and for making this beautiful little quilt for such a good cause.